One particularly successful project, the COOLEST cooler, attracted over 60,000 backers and over $13M (yes, that’s thirteen million dollars, US). Over $50,000 of those backers chose as their reward one cooler delivered within the USA, at a cost of $200 ($185, plus $15 shipping). Shipping made the cost higher for the over 7,000 backers who had a cooler delivered to a country other than the USA. Other backers chose more modest rewards, such as a COOLEST party cup and blended drink book for $25. The most expensive reward cost $2,000, and included a visit from the project creator. 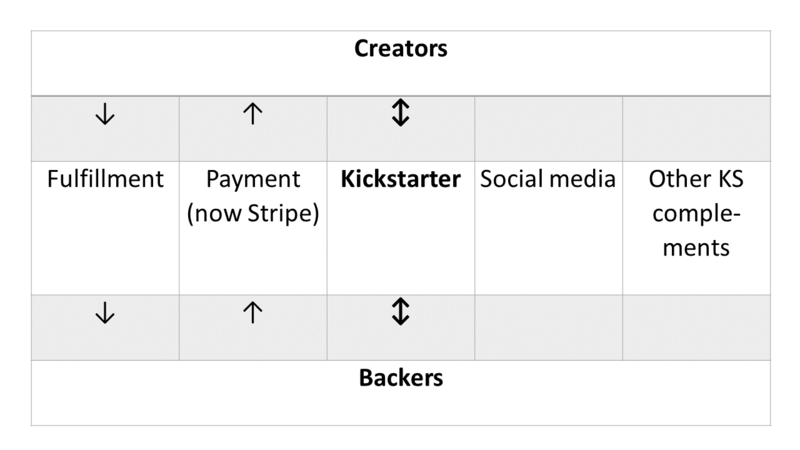 The COOLEST example illustrates two essential and specific flows between creators and backers. First, payment flows from backers to creators. Currently, Kickstarter directs backers to an Amazon online payment service. It will soon migrate to the Stripe service. The second process, fulfillment, includes the packing, transport, and delivery of rewards to backers. Kickstarter leaves the fulfillment decision to project creators. One of the advantages of crowdfunding for the project creator is that backers have incentives to recruit further backers. If a project does not achieve its funding goal, backers do not get their rewards (and neither do they make their payments). Some projects are structured so that this incentive persists even after the funding goal has been met. Creators may specify stretch goals: specific funding targets above the initial goal, with rewards improving as each stretch goal is met. This is an economic incentive for backers to recruit. There may also be a social incentive: backers may feel that their friends would like to know about the opportunity to fund the project, and to receive a reward for doing so. Backers and creators often use social media to tell prospective backers about projects. Facebook and Twitter fit here, since they are so widely used. Other social media have a narrower focus, and are important within specific niches of the Kickstarter ecosystem. Tabletop games provide an example of a niche, and of the categorization of Kickstarter projects. A creator may place a project in one of a number (currently fifteen) of broad categories, some of which have subcategories. For example, the Games category has two subcategories: Tabletop and Video. Tabletop games include board games and card games. Such games are the focus of BoardGameGeek. If the purpose of a project is to fund a new board game, the project’s creator is likely to be active on BoardGameGeek, as well as on Facebook, Twitter, and Kickstarter itself. Finally, the exhibit shows that there are other Kickstarter complements, besides those already discussed. One example is Kicktraq, which takes data from Kickstarter projects and generates charts and other material of interest to creators and to others who use or watch Kickstarter. I welcome comments, especially suggestions for improvement on this version of this note on Kickstarter. I am thinking of expanding on other Kickstarter complements. I stopped writing here because the PDF/Word version just fits on to one (double-sided) sheet of paper, but that’s a rather arbitrary limit.